Encircling the city of Amarillo for 39.97 miles, State Loop 335 varies as a surface arterial with two or four lanes. Several interchanges line the route as it travels around both the rural and suburban periphery of the city. Further north on the west side of Amarillo, a full stack interchange is proposed for SL 335 and IH 40. SL 335 will take a new alignment west over FM 2186 from Soncy Road and north over Helium Road to IH 40 near the west end of Business Loop I-40. 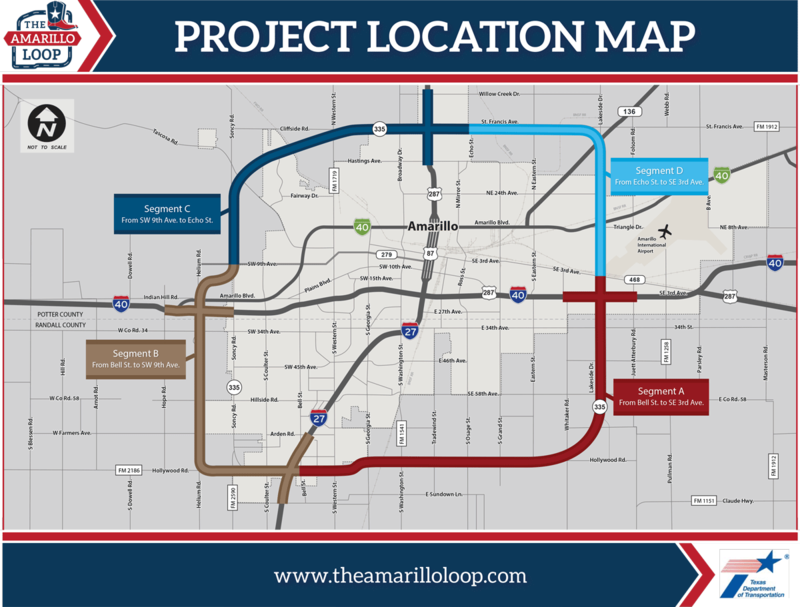 Construction underway in 20162 involved Segment A of the Amarillo Loop project. This converts the two-lane section of SL 335 from Bell Street east to FM 1541 to a four lane highway with frontage roads. Segment A also includes expansion of SL 335 east from FM 1541 to IH 40 and 3rd Avenue on the east side of the city. That work was in the planning stage in 2016. Segment B widens existing SL 335 from Bell Street west to FM 2590. A new terrain alignment will extend SL 335 further west along FM 2186 to Helium Road, with Segment B building a four lane highway with frontage roads north to SW 9th Avenue. Segment C expands SL 335 north to four lanes with frontage roads from SW 9th Avenue to FM 1719 and east to Echo Street. Segment D upgrades the remaining northeast quadrant of SL 335 from a four lane arterial into a four lane freeway with frontage roads. U.S. 87 & 287 (Dumas Drive) follow a 1965-built freeway south from Loop 335 (St. Francis Avenue) to Downtown Amarillo. Photo taken 05/05/12. Leading away from the diamond interchange with U.S. 87 & 287, SL 335 expands to four lanes with a grassy median. Photo taken 05/05/12. A diamond interchange follows on Loop 335 west with FM 2176 (Broadway Drive). Photo taken 05/05/12. FM 2176 heads south to Ross Rogers Golf Course and NW 24th Avenue, and north to FM 1719 (Givens Avenue). The state maintained section of Broadway Avenue is 6.05 miles long. Photo taken 05/05/12. Loop 335 advances west as a four lane divided highway and crosses into unincorporated Potter County. Photo taken 05/05/12. Sage brush populates vacant land northward from Loop 335 to the distant Rolling Hills community. Photos taken 05/05/12. FM 1719 lines Western Street north from Business Loop I-40D (Historic U.S. 66) north to meet SL 335 at a diamond interchange. Photo taken 05/05/12. North from SL 335, FM 1719 (Western Street) continues its 10.09 mile route by the Rolling Hills community to Givens Avenue. Givens Avenue turns the highway east to U.S. 87 & 287. Photo taken 05/05/12. Suburban development encroaches from the south at the Woodlands of Amarillo community located along Coulter Street. Photo taken 05/05/12. Loop 335 reduces to two lanes ahead of the BNSF Railroad underpass. Photo taken 05/05/12. The 720 foot long bridge over Hester Road and the adjacent BNSF Railroad line was built in 1998. Photo taken 05/05/12. The BNSF Railroad straddles the Amarillo city limits north to Cliffside Road. The line ventures northwest to Channing. Photo taken 05/05/12. Motorists on Loop 335 west enter the Amarillo city limits ahead of Coulter Street south to the Woodlands of Amarillo and Westcliff Park neighborhoods. Photo taken 05/05/12. Curving south, Loop 335 next meets FM 1061 (Tascosa Road) near the town of Bishop Hills. Photo taken 05/05/12. FM 1061 travels 33.56 miles overall, from Business Loop I-40 at Gem Lake Road in Amarillo, northwest to U.S. 385 in Oldham County. Photo taken 05/05/12. Provisions for the eventual four laning of Loop 335 were made at the 1999-built diamond interchange with FM 1061 (Tascosa Road). Photo taken 05/05/12. Cardinal direction banners for SL 335 switch from west to south beyond FM 1061. Photo taken 05/05/12. Loop 335 overtakes Soncy Road to southwest Amarillo. Future construction of the Amarillo Loop project (Segment C) will shift the highway westward onto a new alignment south of SW 9th Avenue. Photo taken 05/05/12. Continuing south with two lanes, Loop 335 passes by Stoneridge Drive and the Estates of Stone Ridge subdivision. The small community is home to $1-million plus residences. Photo taken 05/05/12. Soncy Road expands to a five lane arterial south of SW 9th Avenue. Photo taken 05/05/12. Running along the Amarillo city line, Loop 335 intersects Business Loop I-40 (Amarillo Boulevard). Amarillo Boulevard (Historic U.S. 66) arcs northeast as a commercial arterial to SW 9th Avenue, the pre-1953 alignment of U.S. 66 leading east into Amarillo. Photo taken 05/05/12. Business Loop I-40 (Amarillo Boulevard) extends west 2.3 miles from SL 335 to merge onto Interstate 40 west. Photo taken 05/05/12. Soncy Road enters a commercial strip south from Amarillo Boulevard to Interstate 40. Photo taken 05/05/12. Confirming marker for Loop 335 posted ahead of the diamond interchange with IH 40. Photo taken 05/05/12. IH 40 travels east across Amarillo, passing south of Downtown at IH 27 en route to Oklahoma City, Oklahoma. The freeway west quickly becomes rural after SL 335 en route to Vega, Tucumcari and Albuquerque, New Mexico. Photo taken 05/05/12. The south side frontage road of IH 40 connects SL 335 with the eastbound on-ramp beside Westgate Mall. Photo taken 05/05/12. "Decreased state funds slow Loop 335 progress." Amarillo Globe-News, August 29, 2016. "TxDOT proposes new $30 million project." NewsChannel 10 (Amarillo, TX), November 21, 2014. "More money for Loop 335 project." NewsChannel 10 (Amarillo, TX), March 3, 2017.